Very unusual, but delicious combination of ripe currants and gooseberries in the jam will surprise many. - 20 g cherry leaves. 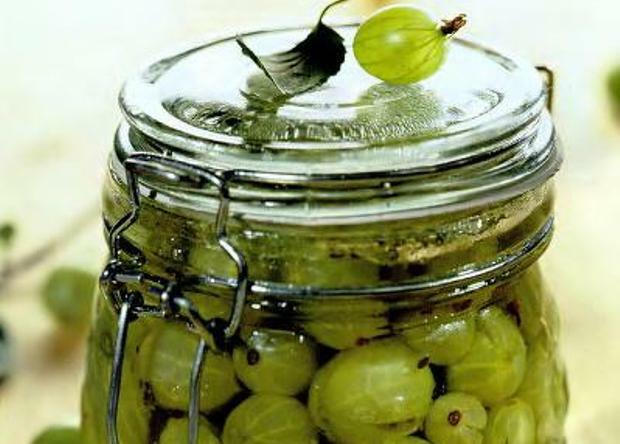 For this recipe well suited to any variety of gooseberry, the main thing - that the berries were not very small, better to take a major, they are more juicy. Currants are best taken black, it better emphasizes the taste of gooseberries. But you can make a jam from any fruit, though red or white, it all depends on your taste preferences. In cool water, thoroughly rinse the gooseberries, and fold it on a large wide sieve or colander to cool a little. With small scissors cut off the tails and tips. Big fat Gypsy punch the needle through each berry several times in different places. Currants well wash also fold in a sieve and allow to drip dry. Remove twigs and leaves, if any. In a large bowl of a blender mix the currants. Press through cheesecloth into a Cup of currant juice. In a large pot pour a liter of water. Wash the cherry leaves and dip it in the water, let them boil for twenty minutes, then remove and discard. Add cinnamon sticks, let them also cook. A decoction of the leaves dilute more with water, add the sugar and stir to combine and until the sugar is completely dissolved. Add the gooseberries and cook like jam half an hour, then remove the foam and add the currant juice and cook for another twenty minutes. Ready jam cool down and lay on the banks.